I am about to renovate my room. A part of this plan includes painting all but one wall and the ceiling white, the other wall will be bright green. My walls are lightly textured and if this makes any difference, the original surface under most of the walls is plaster and lathe (with the exception of the wall being painted green, which is drywall). The surface I will actually be painting over will be the previous coating of yellow semi-gloss paint that is about 20 years old. So here's my question... How do I get crisp, clean edges in the corners where two colors meet (keeping mind that these are semi-gloss walls and are textured)? Use painters tape (blue tape, Frog tape, lots of different names and brands) to mask off the areas you don't want to paint green. Once the white paint is dry, go ahead and paint with the green, using however many coats you need. Peel off the tape carefully and enjoy! Most painters tape says to peel off within 14 days, so you could tackle this project over two weekends if needed. Also, if you seal the tape with too thick of a coat, some of that paint could come up when you peel the tape off, so don't glob it on. In my experience, tape just doesn't do that well. Even if you get a clean line, you're at the mercy of the tape's shape, and it's following the texture. It often ends up looking artificially sharp and jaggy. Instead, use what I call the twitch technique, which is a variation of the standard cut-in. Load your brush on one side, just an inch deep or so. Press the loaded side to the wall and flex the bristles to create a tapered edge in the brush. Now work your way down the corner, twitching the brush with tiny movements. By doing so you can control the position of the brush edge and work toward the corner with precision. The first third of this video clip shows how to load the brush with paint and hold it to create the edge. Introduce a slight twitch to see the magic in action. The result will be a much more natural line which works with the texture, not in spite of it. With a little practice you'll be able to work along wall and ceiling corners without messing around with tape. It's liberating! If you decide to use tape rather than learning how to cut in with a brush, make sure you use the blue type masking tape and also run a flexible painters scraper along the inside edge to really seal the inside edge down. If you don't, you're guaranteed to get some 'bleed' underneath the edge of the tape. offset the color interface a bit from the edge. Two to ten centimeters or one to four inches, depending on your liking and the interrior design and situation. Not only does it save you from the headache of getting the edge right, it also gives you more creative options and possibilities to liven up your room. 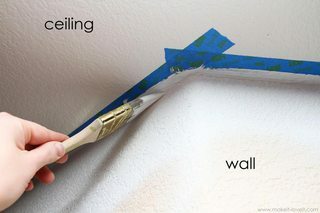 Cover the edge of one wall with tape, so you can quietly brush the other wall, without worrying to get out of the lines. I used this trick between the wall and the ceiling, but it will work between any two surfaces. Note (thanks Carl): First paint over the edge of the paper tape using the same color you're going to use on the wall without the tape, and then paint your final color once this has dried. I've used the Shur Line brand edger tool with great fast results. The only trick is to be very careful dipping the tool in paint, if you get paint on the plastic parts of the tool and not just the pad it will start to get on the other surface. Not the answer you're looking for? Browse other questions tagged painting repainting texture or ask your own question. Painting over bright color with Kilz and single-coat of one-coat paint: overkill? Underkill? Overlap When Painting Stripes: Can I Sand? Drywall skim coat over painted CMU? Removing silicone caulk from wall for painting? Painting over already painted plank walls, do I need to sand it before? What processes do I need to carry out before repainting my wall? Should I plaster the walls in my new house?